Who can think of a quicker switching window gesture? Edited: Handy orientation-defined default gestures, especially in tabbed applications, may be swipe from right to switch tab, swipe from left edge to switch to next open app. These are like ctrl+tab and alt+tab respectively, in some desktop OS environments could speed work flows for users in flow insomuch as such a mental state is likely wrt handheld computer use. Fidget or flow, it's nice when our tool is so easy to use we hardly notice our smooth pace of work until afterwards because tasks complete early. See here for the original answer. Great idea, but I'm not sure how often I will accidentally switch to an other program and not going back to the home screen as there is not much empty space. I like this one too! @hongakonga it wouldn't necessarily the whole cover area that responds to the release event, it could just be an area in the middle of the cover. Either way, there should be both visual and tactile feedback when entering this area, similar to pulley menu feedback. Benefits: No buttons required, minimal changes to the current user interface, one hand friendly. Drawbacks: Swiping from the left again and again and again to toggle between two applications can be a little unintuitive. Note: The left and right swipe from edge actions should be able to be toggled. You missed lock. Which IMO should be swipe from top. And SFleft should be closed. @ApB - Locking would work the same way it does now. Yes it could but its wrong. One swipe must have one function IMO. Jaakko has already come up with one, which I hope comes to the Jolla Phone as well. Its two handed, and takes further advantage of the homescreen peek gesture we all know and love. 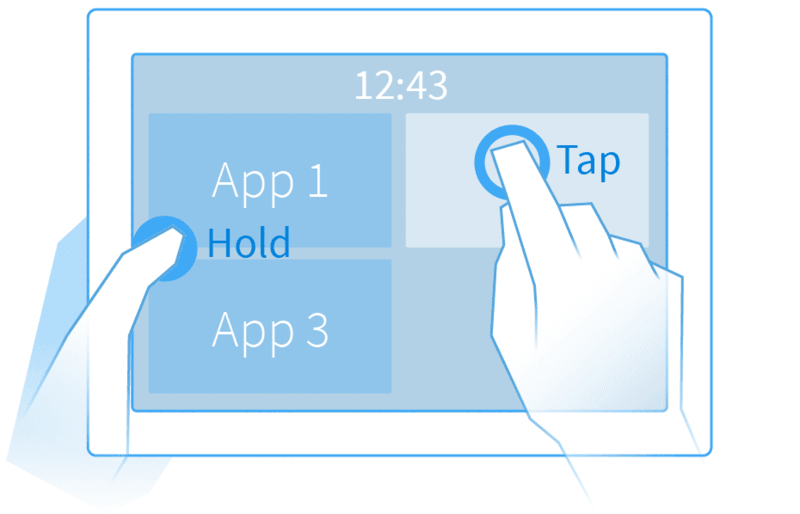 Multitouch, ok, but what about single-handed use? That would be awful for a phone, and looks distinctly awkward for a tablet. You can try it out on your Jolla phone, of course it wont actually do anything but I'm sure you can imagine. I don't think its awful, but the beauty of it is that if it is awkward for you then don't use it, it doesn't break any existing functionality. I also disagree that we need to provide a one handed gesture for everything, that will quickly get messy as you can obviously do more with two hands than with one in real life. So providing natural two-handed follow on gestures from one handed core gestures is a good way to go. Maybe tap and hold for window selection could make use of the remorse timer (visible timeout bar) without implying some kind of regret. The single-handed gesture after long press on an otherwise non-interactive screen area and before the timeout times out, would cause the window thumbnails to be temporarily visible. This does feel somewhat redundant unless we're talking about browser tab cycling maybe. This is not an answer, but just a clarification. Many people have got themselves perplexed about the "swipe from right" and "swipe from left" gestures. The reason for Sailfish having same operation (minimize the app or bring up ambience) is CONSISTENCY. You can hold your phone in either of your hands to perform this action. Here is where one handed use of phone comes into play. So, there is no use in suggesting different actions for swipe left and swipe right. Anyone can correct me if I am wrong here. The CONSISTENCY is broken already. Swipes from left/right work different ways in different screens. I have no problem with swipe from left and swipe from right doing different actions. After all, left and right have different connotations in my mind anyway. I do not wear my watch on the righ hand. I do not read from right to left. I don't think consistency is broken. Swipe from Left/Right from any screen minimizes the app. Does any of the screens break this consistency? But my comment was toungue-in-cheek only, it was not meant to be read seriously. I didn't take it seriously and I didn't mean to be offensive too. Sorry if it was so. I just wanted to make everyone understand about the design of Sailfish OS. Even in home screen, swipe from left or right does the same thing. It doesn't do two different things. This is what I meant by consistency. You can get more info on the design of Sailfish OS from Jaakko's blog. Sadly there isn't one. We only have 4 possible ones and 1 of them has 2 functions. 2 are "wasted" on minimization. Except if we start utilizing 2 finger gestures which goes against the one hand device principal jolla is build upon. Swipe from outside and tap the next is fast enough IMO. You could also swipe from outside horizontally and then vertically, to go up/down between apps when swiped deep enough, no? As old Opera-user I knew the concept of swipes as "mouse gestures" since years. I think, there are some more possibilities than only swiping from one of the four outer edges to the inside, it's only a question of exercise and habituation. I would find "left-up" and "left-down" feasible, also "right-up" and "right-down". No. Just no. Do not take away the most useful gesture, closing the app with a swipe. If you do, I will give my Jolla to the Gypsies. @Pichino, I'd like to know why this is should be the most use full gesture. Unused programs are closed anyway when memory is short. I don't know any other OS on the mobile marked which has such a feature. There must be a reason for that. That's because other mobile OS's don't have true multi tasking. Leaving apps open even if you don't need them and waiting until the memory manager decides to close them is a waste of battery life. We need to find a way to pool votes. Not exactly a duplicate. I added browser tab switching, just lately.